The release of A1 Sitemap Generator version 3 enables all websites, including those using middle and far eastern languages, to take advantage of a complete suite of sitemap tools that can help search engines index more pages. Microsys, a leading company in website optimization and promotion tools, today announced availability of A1 Sitemap Generator version 3. People all over the world can now take advantage of the technology in A1 Sitemap Generator to help them get their websites fully crawled and indexed in search engines. Users will be able to create many popular kinds of website sitemaps with A1 Sitemap Generator: Classic HTML sitemaps for website navigation, RSS feeds, URL list text files and XML sitemaps, including image, video and mobile Google sitemaps, to help search engines crawl and index more website pages faster. The A1 Sitemap Generator crawler engine supports simultaneous connections, output and analysis filters, robots.txt with wildcards, noindex, nofollow and canonical tags, forms, meta redirects, removal of session IDs, multiple start scan paths and websites on internet, localhost and local disks. When creating sitemaps a variety of options are supported. HTML sitemaps using customizable templates. XML sitemaps split and compress. 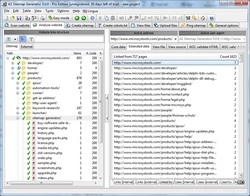 Google XML sitemap extensions such as mobile, video and image sitemaps. Built-in FTP upload and search engine sitemaps ping. A1 Sitemap Generator also supports a command line interface that allows to automate the most used crawl and sitemap tools. With A1 Sitemap Generator version 3, owners of multiple language websites of middle and far eastern origin can now use the A1 Sitemap Generator program without the need for any further configuration. "With the recent updates to our sitemaps technology, A1 Sitemap Generator is positioned to be a favorite tool in any webmaster toolbox across the globe" said Thomas Schulz, lead developer and owner of Microsys. A1 Sitemap Generator version 3 runs on all Windows platforms starting from Windows 2000 till the newest, Windows 7. Version 3 introduction prices are $49 for "standard edition" and $69 for "pro edition" (both prices in US dollars). The A1 Sitemap Generator has a 30 days fully-functional trial that allows users to create all above mentioned kinds of sitemaps for their websites. Further information including the free evaluation is available from the A1 Sitemap Generator product page. It is possible to order the tool through the Microsys website. The program comes with both an installer and uninstaller, and the user interface has been either fully or partially translated from English into other languages such as German, Spanish, Russian and Arabic. Microsys is located in Aarhus. The company is proud to be a member of the Association of Software Professionals. More information can be found at the Microsys website.